Can the Archos GamePad 2 improve on its disappointing predecessor? The first Archos GamePad was a disaster - it was slow, the screen was abysmal, and the controls didn't work properly. The maker has quickly released a successor, the Archos GamePad 2, which packs respectable hardware, a new HD-quality screen, and support for publisher GameLoft's games. Is it finally the Android games console we've been waiting for? 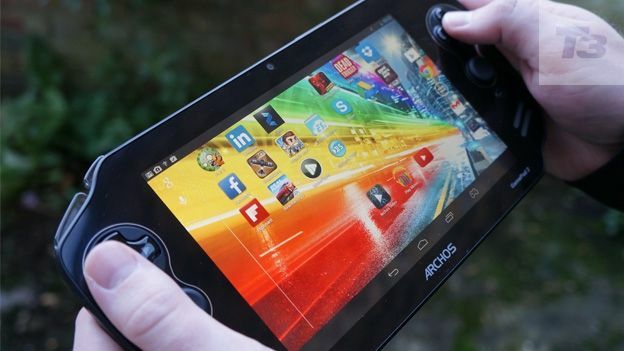 The Archos GamePad 2 is a 7-inch tablet with game controls adding a couple of centimetres of extra length (or width, as you'll be holding this in landscape mode most of the time). It's over a millimetre thicker than the Google Nexus 7 at 9.9mm, but it's still small enough to easily slide in a backpack at 200.5mm x 154mm. The 400g weight is over 100g more than the Nexus 7, but it still feels nice and light. The GamePad 2 is certainly a lot sleeker than the Wikipad - its closest competitor that features a really bulky frame for game controls. GamePad 2 is completely plastic and therefore doesn't feel like a premium product, but it feels solidly constructed, and rugged enough to survive being in a bag without a case. The GamePad 2 is a relatively powerful Android tablet - its quad-core 1.6GHz A9 processor/Mali 400 GPU won't trouble the likes of the new Advent Tegra Note and its Tegra 4 processor, but it's fast enough to run Android 4.2.2 Jelly Bean without slowdown. It's fast enough to juggle multiple Android applications at the same time, and will play 1080p video without stutter. In this regard, Archos' own Video App is good - it supports most major file formats and even plays media from network storage such as our Synology DS214Play Network Attached Storage device. There are third-party apps like MX Player that will also do this on Android, but we liked that it was all included by default on the Archos. There are a decent amount of connections on the GamePad 2 - in addition to micro-USB for charging and data transfer, there's mini-HDMI out for playing on a TV or monitor, and a microSD slot, which will take cards up to 64GB. We really like the latter feature, which is still a rarity on a lot of tablets, and allows you to buy the cheaper 8GB version of the GamePad 2 and expand the memory cheaply. On the wireless side, the 5GHz wireless connectivity offers a fast link to your home network and will help when streaming video to a Miracast device, if you have one. If you're watching on the device itself, the built-in stereo speakers are good, and provide plenty of volume if you want to listen to music. The 5000 mAh battery sounds impresses on paper, and is quoted at lasting nine hours, but we found it was closer to seven hours in practice. If you're an Android OS fan, it's worth noting that Archos sadly isn't working to bring version 4.3 to the device right now. We were also disappointed that there's no rear-facing camera on the GamePad 2, which is always nice to have, while the front-facing camera didn't impress. Archos has really improved the screen on the GamePad 2 over the first model, and it now boasts a 1,280 x 800-pixel 7-inch display. That said, the Nexus 7 now offers a full HD 1080 screen, and is available at the same price. While the screen isn't as detailed as its competition, it still looks good at max brightness, with ample contrast and rich colours. It will also support 1080p output when connecting to an external display. The GamePad 2's controls are also a massive improvement over the original in terms of quality and comfort. The d-pad is now one single unit, which makes it way easier for your thumb to make smooth movements across directions. The two analogue sticks are also good - they're not as satisfying as the more pronounced sticks on the PS Vita, but they're precise and don't induce thumb cramp. There are also now two shoulder buttons on each side of the console, although we found we had to overstretch just a little to reach the innermost button. You can also play all your normal Android games using the touchscreen interface, and it's way more comfortable to do this on the GamePad 2 than the Nvidia Shield. You can also map touchscreen inputs to the controller using Archos' Game Mapping software, and there are 600 games that have pre-mapped settings you can download. However, we'd strongly advise against doing this. The mapping works for basic games with one-button interfaces such as Jetpack Joyride, but anything more complicated just doesn't work satisfactorily. Archos' main partnership on the game side is with Gameloft, which is well known in the mobile game space. True, its catalogue consists mainly of licensed movie-based games and rip-offs of well-known console franchises, but its games are generally well made, if slightly soulless. As a result of this partnership, all of Gameloft's games now support the GamePad 2's native game controls, while the console comes with Modern Combat 4 and Asphalt 8 pre-installed for free. While Asphalt 8 was a lot of fun, we found that Modern Combat 4 struggled with very poor frame rates - it was nearly unplayable at times, even when we closed all other applications to free up memory. Any pre-existing Google Play purchases linked to your account will work on GamePad 2, but we found the game controller support really limited. Grand Theft Auto Vice City didn't support the controller, even though it does work natively on Wikipad, as well as third party Android controllers like the Moga Pro. We did find we could use the controller with many popular emulators though, so if you're comfortable with the legal and moral implication of such things, the GamePad 2 makes quite a good portable retro games console. The second GamePad from Archos is a massive improvement on the first. The game controls are great, there are welcome features like microSD card support, and it doubles up as a very capable Android tablet. However, the game support is weak right now, and Modern Combat 4 is a poor showcase for the machine. Right now, the Nexus 7 paired with a controller like the Moga Pro is a more compelling setup for Android tablet-based gaming.